This smooth Cuban cigar has always been appreciated for its sweetness. It has discrete, elegant qualities that in no way prevent it from revealing its woody, spicy character, especially in the final phase of the cigar. 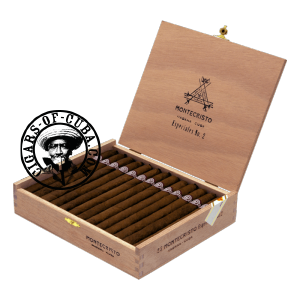 The smoke remains creamy and smooth throughout, so it will suit anyone in search of comfort cigars. Can do with some age to take the young tobacco edginess off. Among the best Laguito No.2's on the market. It's an extremely well made cigar. There are concentrations of flavors of sweet spice with hints of cedar and a sweet woodiness. An excellent well balanced Montecristo. Can do with some age to take the young tobacco edginess off.